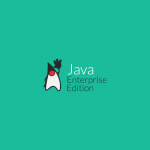 Read this page for installing and setting up the environment for developing and deploying EJB 3.0 Session bean on JBoss application server. 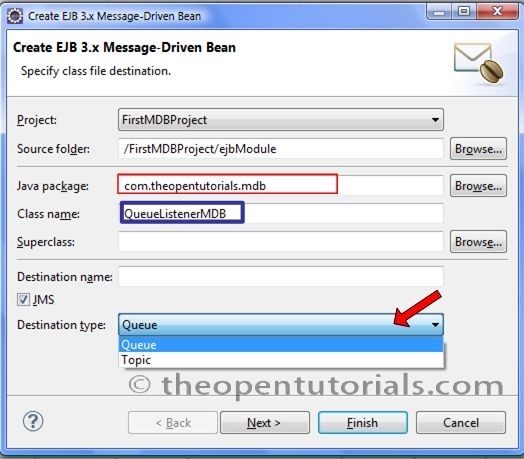 We are going to create a simple EJB 3 Message Driven Bean and a Web client (Servlet) which sends messages to the Queue destination. 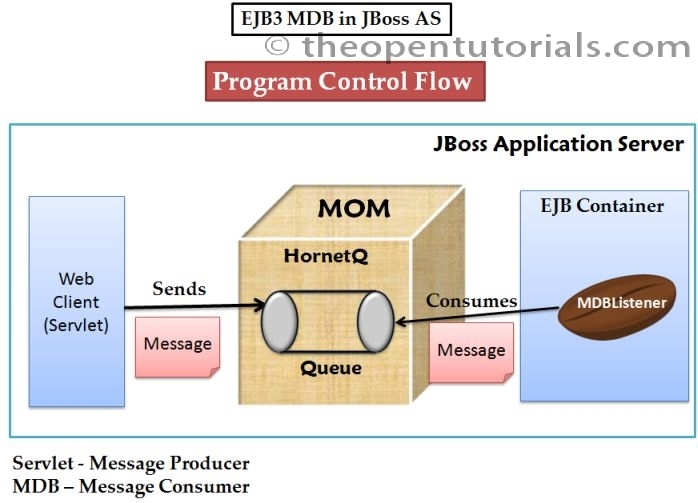 This example explains how to develop, deploy and run EJB3 MDB as a message consumer in JBoss application server. 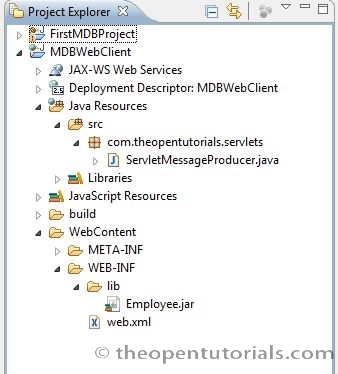 For testing this MDB listener we write a Web client (a servlet) as a message producer which sends a simple text message and an object message. The message driven bean (message consumer) and the Servlet (message producer) are deployed on the same server instance (JBoss AS). 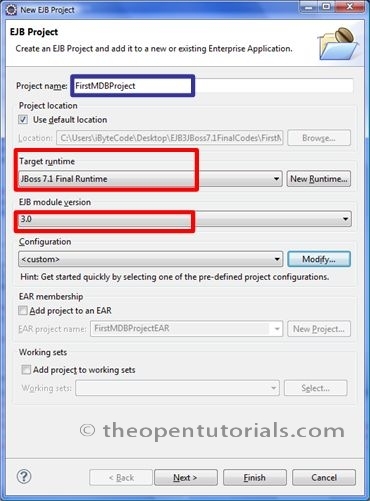 Enter the project name as “FirstMDBProject” and make sure the JBoss 7.1 Runtime has been selected with the EJB 3.0 Module version. This project uses Java 1.6 version. The default Java version in Eclipse Indigo is 1.7 so to change the “Configuration” click on “Modify…” button to make changes. Click Next -> Next -> and Finish. 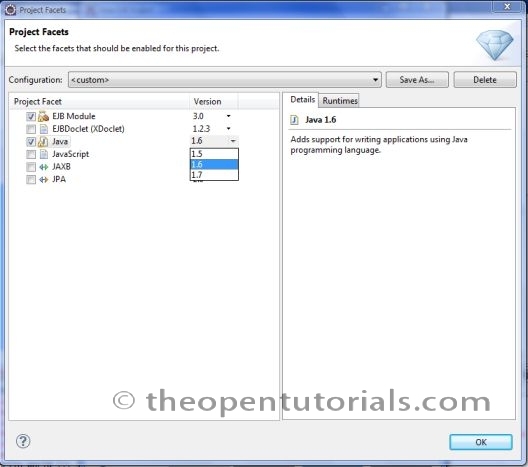 You will see an EJB project in the Project Explorer view. return "Employee [id=" + id + ", name=" + name + ", designation="
System.out.println("Queue: I received a TextMessage at "
System.out.println("Queue: I received an ObjectMessage at "
The activationConfig property of @MessageDriven is an array of ActivationConfigProperty and it should specify the destinationType (Queue or Topic) and destination (Queue/Topic’s JNDI name). In the onMessage() we are receiving two types of message, TextMessage and ObjectMessage. In the previous version of JBoss AS we had an option to configure the messaging destinations (Queue or Topic) in META-INF/*-service.xml with element. In JBoss AS 7, it is configured in main application server configuration file (standalone.xml) which is found in JBossAS_Home/standalone/configuration. 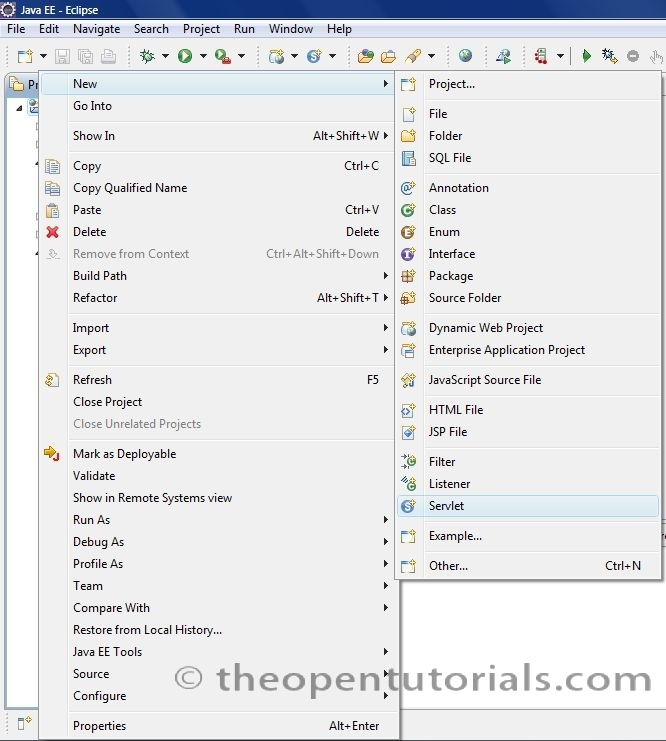 Open standalone.xml and follow the steps below to configure messaging services. Add the following <subsystem> inside <profile> element. The entry name for jms-queue should match the destination activation config property in @MessageDriven. 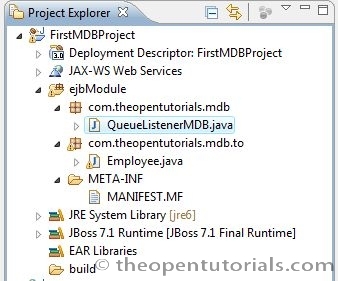 Now we need to deploy the EJB project “FirstMDBProject” on server.. Right click on the EJB project -> Run As -> Run On Server. Select the existing “JBoss 7.1 Runtime Server” and click Finish. Right click on “JBoss 7.1 Runtime Server” available in Servers view -> Add and Remove… -> Select the EJB JAR file from the left pane and click Add-> and then Finish. Right click on “JBoss 7.1 Runtime Server” from Servers view and click on Start if it has not yet been started. If the project is deployed properly with global JNDI mapping then you will see the following message in the console. The next step is to write a Web Client (a Servlet) which produces the message and sends to the Queue. The servlet uses JNDI to lookup ConnectionFactory and the Queue. Enter the project name as “MDBWebClient” and make sure the JBoss 7.1 Runtime has been selected with the Dynamic web module version as 2.5. Click “Next” -> “Next” -> and “Finish”. You will see the Dynamic web project in the “Project Explorer” view. 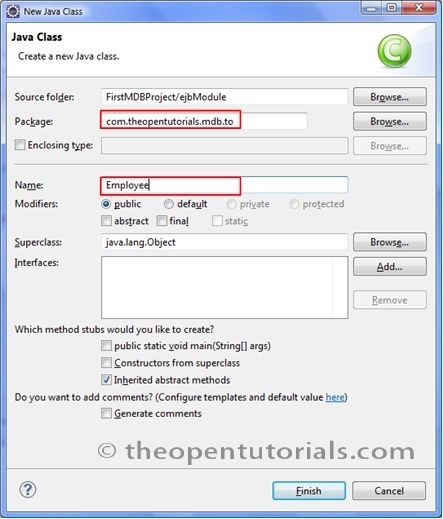 To send object message servlet needs Employee class which we have created in FirstMDBProject. 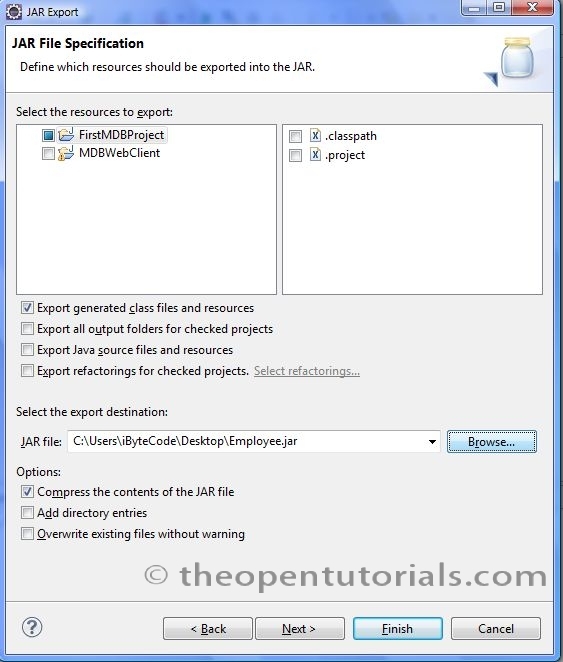 Right click on Employee.java file in FirstMDBProject -> Export. 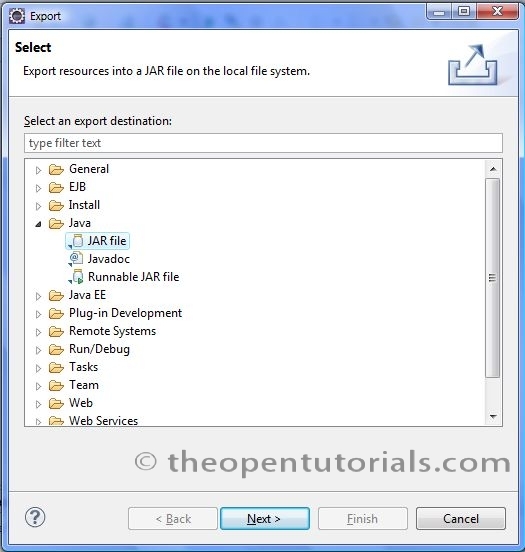 Expand Java folder and select “JAR file” and click Next. Click on Browse… and enter the file name and Finish. 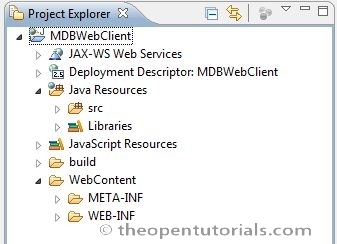 Now copy the created JAR file and paste it in MDBWebClient/WebContent/WEB-INF/lib folder. In the doGet() method copy the following code. 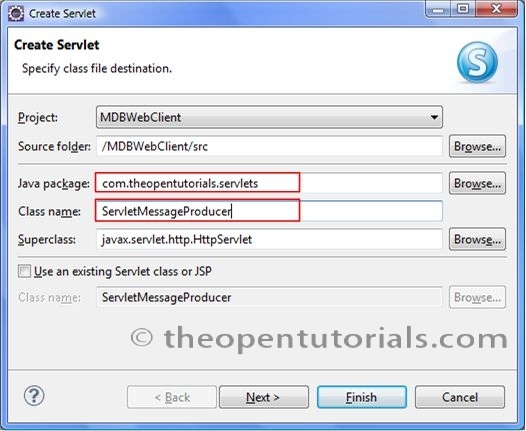 Now we need to deploy the servlet’s project “MDBWebClient” on server. 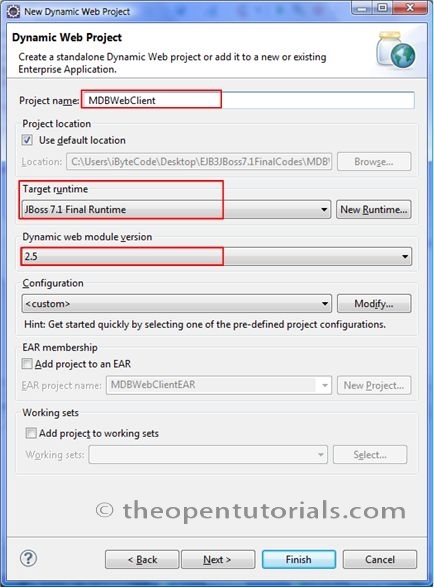 Right click on the “MDBWebClient” Dynamic Web project -> Run As -> Run On Server. Select the existing “JBoss 7.1 Runtime Server” and click Finish. Right click on “JBoss 7.1 Runtime Server” available in Servers view -> Add and Remove… -> Select the WAR file from the left pane and click Add-> and then Finish. If the projects are deployed properly then you will see the following message in the console. 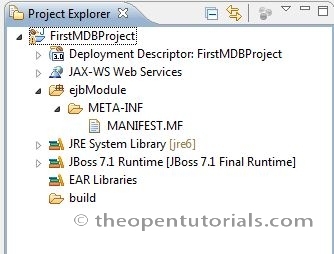 The figure below shows the final directory structure of EJB project “FirstMDBProject”. 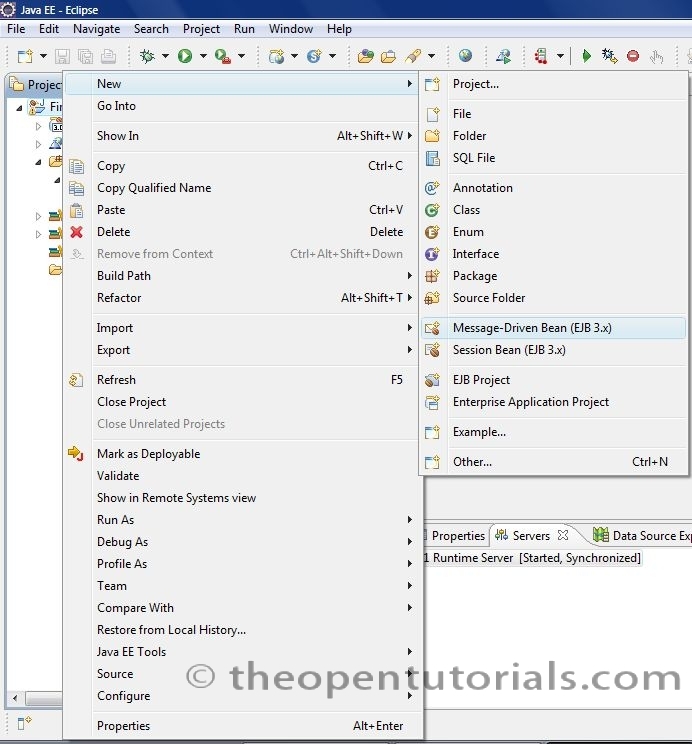 Use Ctrl + F11 to run the Servlet and select the existing JBoss Runtime Server and Finish. JBoss Runtime Server Console will display the following output. [stdout] Message is : Hello EJB3 MDB Queue!! !